The DSS system extends a foil to the side of the yacht to help it stabilise. ‘Revolution’ is perhaps an overused word. Not everything is equivalent to the overthrow of an existing regime. But the Dynamic Stability System (DSS) developed by naval architect Hugh Welbourn, business partner Gordon Kay, and engineer Will Brooks probably is. These fellows are such good sailors that if they didn’t have degrees and day jobs, they could be making a living out of it. Welbourn is a foil and ratings specialist and has ‘optimised’ and raced some of the most interesting boats in the world, from Olympic class dinghies to maxis and Swans. Brooks, a structural engineer to five America’s Cup campaigns, is the half of the technical team that has to make it all work. Welbourn Design was an early adopter of velocity prediction programs (VPP) and computational fluid dynamics (CFD) to study the interactions of foils with water and the effects of foil types on motion. Sailors of fast boats know all about motion and the fatigue it puts on both structures and crew. Existing keel designs have had a tremendous impact on speed, says Welbourn, but do nothing for pitching, yawing and vertical acceleration. Looking for ways to reduce motion without reducing speed, in 1997 he began running computer analysis of the lift-to-drag ratios of horizontal retracting foils. While other engineers were putting effort into canting keels or extremely deep bulb keels, Brooks was not a fan of either. In 2002 he began working with Welbourn to test ideas on radio controlled models. Next, for design development, they used tank, VPP, and real-time sailing data from the 28m supermaxi Bols (now Med Spirit) as a baseline, then tank tested a 1/10 scale model of the next generation 30m raceboat. 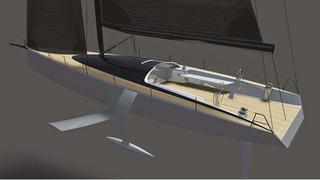 This showed them just how critical parameters such as fore and aft location of the horizontal foil were to performance. Testing was performed with the Wolfson unit at the Southampton Institute, and higher speed runs at the GKN tank in Cowes – the expensive way to gain hard data. 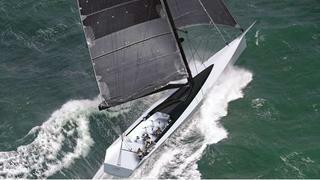 The team then put a fixed foil on half of a seven metre boat in Australia. ‘What it did was give us instant comparative data tack to tack,’ says Welbourn. When the side with the foil consistently out-performed the foil-free side in all conditions by up to 35 per cent, they knew they were on to something that was more than a scientific exercise. Welbourn patented the design as the Dynamic Stability System (DSS).